And my mind’s eye responds simply with an image of boundless blue ocean. I must go. That image awaits me. It has lured me in a thousand ways. In dream after technicolour dream. The brilliant gold-tinted blue of a sun-kissed ocean, much like the blue tiles of Mediterranean artisans, touched occasionally, nonchalantly, and with the security and self-confidence brought by moments of wealth, with spare gold. Blue and gold. And after nights of toiling, days of waiting, hours of anxiety and minutes of panic, I am in Lisbon. Indeed, mad dogs, Englishmen and I appear to be the sole adventurers on the Avenida de Liberdade. It is 2 p.m. and time to stay indoors. What is it about this road that takes me home to Bombay where there are no islands of trees dividing broad avenues? Is it the sun? Is it the trees that look like they never shed a leaf in their life? Is it their unfussy flowering? I have seen these buildings before too. Strawberry cake with white frosting. Vanilla cake with pistachio flowers and strawberry patches. Angel-white cake with pearly beads and white lace. All holding firm in spite of the sun beating down on them. All facing the world unprotected by the shade of trees. Strong, brave, pristine. Until I cross the road. And then I see—strawberry is peeling, vanilla is stained and the patches are actually scar tissue where plaster molding has fallen off. I have definitely seen this before. At the Praça dos Restauradores, there appear to be no locals, except those cruelly constrained by their occupation as bus driver, café attendant or street vendor to hold down the fort. Nor is there a crowd in the Chiado area. Where did all those people go that got off the plane with me this morning? If I see no one—well, relatively speaking—who lives in these closely built buildings with tile façades on these narrow streets? I come to Lisbon—Lisboa, to give it its Portuguese name—with an assortment of (mostly English) literary images and Portuguese colonial remnants in my luggage. I have been here before. Disastrously, with Cunégonde, Dr. Pangloss and Candide during the earthquake. Then, I came with a couple of fine English aristocrats acquiring scandalous pasts before heading home to the happy endings Georgette Heyer had planned for them. I have come also with the British sailors and soldiers on assorted missions. And finally, gloriously, with the passion of Elizabeth Barrett Browning’s sonnets. In these streets and alleys where I have lived others’ lives, I meet old friends from Colaba and of course, Santa Cruz! Here’s Saldanha and Pinto, there’s da Costa and Silva, and my, Pinheiro, it’s been a long time! Sequeira, Borges, De Souza—you taught me well in school. Are you living here now? But when I look at the faces that go with the names, they are European faces. How disappointing to come this close to home and not be there! I hear you can offer wax body parts at Portuguese churches in your quest for divine intervention. They must have learned that custom from the anxious crowds that throng Mahim Church every Wednesday. I look at these people around me. I walk through the touristy sections of Rossio and no one seems to understand the word ‘vegetarian.’ On my TAP Air Portugal flight, the crew had trouble communicating in anything other than Portuguese. I look at people around me, as lost in their ‘Portugeuse-ness’ as the Koreans are in their ‘Korean-ness.’ I find it hard to reconcile them with the fact of their maritime explorations and overseas empire. I listen to them around me—on the plane, in the café where someone finally understands what I cannot eat, on the street. How did they come up with the drive, the enterprise and the imagination to find and conquer new worlds? Portugal is proud of its past global engagement. The Brazilian cafés, the Angolan and Chinese faces, the monuments and museums, even the street names, attest to this. As colonizers, they have a mixed record. They were terrible, oppressive administrators, but unlike other Europeans abroad, they mingled and intermarried freely, even purposely, with the ‘natives.’ In spite of all this, in the aftermath of empire, Lisbon is not like London, Amsterdam or Paris. The empire has not struck back with floods of immigrants and the production of a hybrid, post-colonial culture—or so it seems. I wander the streets reflecting on these matters—and absorbing this new world. I know I am growing older. The day is finally here when I am carrying food and water with me where I go, and seeking out Indian food. But the triple burden of vegetarianism, a low-cholesterol diet and finicky taste buds completely limit one’s options. And my stomach will not let up because I am traveling through carnivorous cultures. The food is easily explained by one’ s physical limitations. Less easily explained is the great need to speak my native Indian languages. That is more interesting to me. I grew up speaking both Tamil and Hindi poorly enough that little children would ask me to speak for the pleasure of mocking me. Then almost miraculously, my fluency in both languages improved. Now, I cannot resist the impulse to speak them, immersed as I usually am in a mono-lingual English-speaking environment. I walk through a series of narrow streets which are best described as alleys, except that they are not that. You don’t see streets like this in America. The restaurant I seek has an entrance that would serve illicit paramours and spies in trenchcoats equally well. Stepping in tentatively, I find I am alone until a woman appears and shyly invites me in. She and her family are from Mozambique. From India via Mozambique. And given when they made the first migration, from Diu via India via Mozambique. There is a large community of Indians from Daman and Diu here, she tells me. Now I know we are a peripatetic people, but in India’s mind-boggling diversity, it is easy to forget places and people altogether. In thinking about Portuguese colonies in India and Indians who chose to leave at the time of Goa’s liberation/invasion (here, I will learn to remember, if not acknowledge, that there are two words for this historical event), I have forgotten that must include the Gujaratis of Daman and Diu. I have looked for the faces of my Roman Catholic Goan schoolfriends—Cardozo, Pinto, Fonseca, Fernandes—but they blend into the sea of faces (and I have seen seas of faces since that first day). I cannot tell them apart from the Brazilians, I think. Not so long ago, we used to wait for Hollywood films all over the world. There was usually a significant time-lag between a film’s release in LA or New York and its leisurely appearance at Regal or Sterling in Bombay—and this is Bombay we are talking about. Now, I come to Lisbon--not London or New Jersey, but Lisbon—and people get to watch new Hindi movies so often they are blasé about them. But watch them, they do because this is what accounts for the excellent Hindi these Diu-Mozambique Gujaratis speak. The Diu-Portuguese—should I hyphenate their identity American-style and how would they identify themselves? —are not to me visible on the streets of Lisbon. Unlike the ubiquitous South Asian cabbies and newspaper kiosk-owners of New York, software engineers of the Bay Area and janitors at Heathrow, it is hard for me to see where they go when they leave the Indian restaurants where they offer hungry Indian travelers the comforts of home. That these are comforts from a home where few of them live is immaterial. The atmosphere hangs heavy with nostalgia for a world, fading memories of which must be further obscured by the poor lighting that is a decorating staple for Indian restaurants abroad. What is absolutely authentic is the warmth of the hospitality, especially when the guest is an Indian more at home in that sub-continental lingua franca, Bombay film Hindi, than in Portuguese. Bonded by that fragile thread of not-our-mother-tongue-Hindi, guest and host converse at length. Stories of multiple migrations and of “home”—lost, regained, rebuilt—are shared. Opportunities abounded in Portuguese Africa for a community with a maritime cosmopolitanism and entrepreneurial energy. Brother sent for brother, father for son, son for wife and parents. Caught in the cross-fire of independence struggles that became battles of attrition, the community moved again—not to Diu but to Portugal. Building anew, the community has diverse business interests—restaurants, stores, imports and exports, etc. As is the pattern for other South Asian diaspora groups, marriages, education and business are all pursued across the frontiers not just of home and host (countries of origin and residence) but across the other centers of this diaspora. Thus, a Diu-Mozambique-Portuguese girl is married to a young man from Gujarat via Bombay. A Diu-Mozambique-Portuguese son goes to study business in Lisbon. One branch of a Diu-Mozambique-Portuguese family investigates business possibilities in New Jersey and another matrimonial alliances with Gujarat-Kenya-Leicester families. All of these individual (and collective) links are based on a real sense of shared identity whose actual everyday underpinnings are more nebulous. That is, they eat, speak and dress differently. They have shared memories of places they have scarcely visited. Their flight trajectories are different as are their histories. Why did they leave where and when they left? Where did they go? And why did they leave again? All that is common to them is a history of multiple migrations and the tenuous, vague notion of a shared place of departure. The Diu Portuguese are one of Lisbon’s many surprises. They become the lens for me to consider many questions, as one sated on their homely dinners contentedly might. Jacaranda everywhere. That is how I will remember Lisbon. 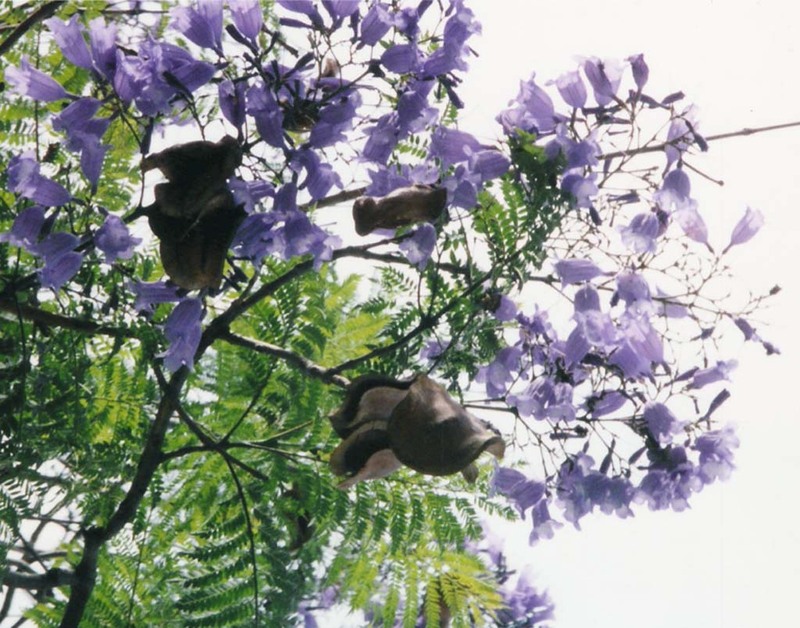 Jacaranda blossoms on trees and on pavements. They carpet the sky with a pretty purple and still-early-spring green. They sprinkle that same purple carelessly over the carefully tiled sidewalks of Lisbon’s main squares. My first walk around Lisbon, apart from leaving me breathless, also made me remember the old Bombay trick of watching where you step and picking each step, nimbly, firmly but cautiously. There are places where you walk, thinking you don’t want to know what went before you. Rather like much of New York City. But in New York, the rubble and dirt do not cover exquisitely paved sidewalks. In Lisbon, the sidewalks deserve to be called promenades. They are broad and expansive in places, and often bear tile patterns (black on light, worn off-white) that are inlaid with regularity, symmetry and precision, almost as though they were block-printed on the ground. You wonder about a people who would go to so much trouble over something they would trample on. You are walking along Praça dos Restauradores, eyeing the throng of fellow-tourists knowingly and the lingering (loitering?) locals (men as always—why do women seldom loiter without a purpose?). With the practiced eye of a life-long city-dweller, you manoeuvre past others, thinking only of two things—where you must reach, and what you might step on. One glimpse of the tiled sidewalk which looks like it belongs on the verandah of an aristocrat’s villa or on the lavish terrace gardens of a Mediterranean estate, and the Praça is peopled with the ladies of the Portuguese court, the fine gentlement with whom they take a turn, Georgette Heyer’s Regency heroes in exile and a couple of ruddy, rough-hewn men, dressed in a style much richer than their features and carriage suggest. Explorers, did you say? Just back from Brazil? Of course, my dear, you would have to ornament these sidewalks—milady could not possibly set her feet down anywhere else! The narrow, climbing side streets have less ornate pavements, but the bounty of blossoms that more than compensates. Narrow streets with houses set so close as to share walls, only the variation in façade decorations giving away where one house ends and the other begins, are home to the rich and to those who serve them. The façades are sometimes peeling, sometimes dull. I think, could people care less? And then through a gap, you see a garden, Grecian-looking urns filled with little pink and white flowers. Bougainvillaea in purple and pink weigh down walls. Another profusion of purple-unrelated to the bougainvillaea—spills over the trellis-walls of the garden. I stand at the miradouro (look-out point, but the Portuguese word is more portentous of the magical view) at the Jardim de Saõ Pedro de Alcantara and take in this beautiful city. At my feet, terraced rows of houses descend into a stately square and behind me, they rise with the pride of those who know they are beautiful. Before me, would be a fairy-tale vista. What there is, is a fairy-tale vista in decay. In the distance, just short of the horizon stands the Castelo de Saõ Jorge, and around it, the packed but expensive housing. The look of genteel disrepair obscures the fact that this is an upmarket neighbourhood. I stand at the miradouro—a word that is resonant to my mind, awakening miraculous, golden images—in a moment that is magic. Before me, lies a city that wears its past still, but does so casually. I stand on a paved terrace for which some artist dreamt up the design that some artisans translated into stone and concrete. Around me, surrounding me, are blossoms I scarcely imagined. This is jacaranda-kissed Lisbon. Where the spirit of a people’s artistry survives beneath the dust and grime of contemporary life. I want to say the sea called me to Portugal. In Hindu myths, deities often appear again and again, calling ordinary men and women to their fold. The sea has thus spoken to me in dream after dream, calling me to its shores. The sea in your dreams can be portentous of ill-luck if it is rough. However, in my dreams, it is always calm, always beautiful, embracing me. And if there are moments of fear or moments of dread in the dream, recalling the sea dispels them. My invitation to Portugal came at a moment when everything in my life felt fraught and uncertain. As I read about Portugal, however, certain names beckoned me—not Sintra, but the Estoril Coast; not Setubal, but Arrábida. The sea, always the sea. As I struggled to mire adversity for spiritual gold, I knew that I could lay my troubles to rest at the Atlantic shore of Portugal. You may read this and chuckle, “Would-be writer’s fantasy!” But I know! I did not know at many turns whether I would make it to Portugal, but I knew I must. And so the first chance I could, I set off (with a colleague) for Sintra and the coast. Sintra is lovely. No, we did not visit the palaces, but the hilly roads and the flowers were pretty too. We stopped in town, walked around, took obligatory pictures before the National Palace and nodded in Pena’s direction. But I could not linger. The main event was elsewhere. At our first glimpse of water, something broke inside me. There, beyond the hills and the hamlet, lay the Atlantic, shimmering and turquoise. I could not wait to jump out and run towards it. But, not yet. When we reached Cabo de Roca, the weight of worry was lifted right out of my soul by the gusty winds that blow there. I found myself running, skipping and bounding across the paths that surround the westernmost point of the Eurasian landmass. I became as light as a blade of grass and as energetic as a child. Copper sulphate around me everywhere, to infinity. The water was as I remembered it. Like those ridged, transparent copper sulphate glass bangles that lie in my dressing-table at home, when the light catches on them and they reflect the gold bangles I am wearing with them. Still and yet turbulent, the water is strong enough to take on the burden of my insignificant life. The expanse of water puts me in my place and allows me to surrender to it much as a child worn out by its frenetic play and willful wakefulness surrenders to sleep in a parent’s arms. At Cabo de Roca, without word, without thought or ritual, I surrender my petty tribulations to the ocean, and invite it to wash over me, remake and redeem me. I find it hard to leave the cape. But this is life and while redemption is certain, attachment to it is not permitted. I leave, like a child being sent away to boarding-school, craning my neck to catch a glimpse of my moment of redemption. The drive down the coast is beautiful. However, my heart keeps asking—did I surrender everything? did I lay it all to rest? did I relinquish every vestige of control? In true bureaucratic Brahmin spirit, I wonder if I ought to have performed some ritual, uttered some incantation to let the ocean know. Ought I to have sought some sign that my surrender was noted? Already my moment of redemption was slipping away. As I write this, I understand the nature of my complete emancipation at Cabo de Roca. For the quarter of an hour that we were there, the winds that were practically blowing me around were in fact keeping me completely in the present. All I saw were the cape, the ‘ice’ flowers and dandelions, and the sun-kissed sea stretching to eternity. I felt the wind and instead of resisting it, allowed it to gift me the sensation of free-flight. I heard the waves and the gale and I allowed my heart to respond with delight and laughter, without a thought to what they might cause (I might be blown off, or people might find me strange). And so the Cabo freed me for one minute, into that minute and eternity. Cascais and Estoril were pretty, touristy towns like Sintra. You remember them for a pleasant afternoon but for me, after Cabo de Roca, they were empty, vacuous. In towns like this, where we tame the universe to our postcard montages, we empty them of their essence, the unique nature that brings us here in the first place. My next marine pilgrimage took me to the Arrábida region. I had looked up Arrábida when I was first invited to this conference. The name captured my imagination and the images captivated me. Jaded as I was feeling after several days of sightseeing, the vistas in this region took my breath away. The mountain-sea combination is always spectacular. Nature puts her two most awe-inspiring features in a single frame. Each on its own dwarves you, and both together leave no room for doubt that we, our lives, with their attendant highs and lows are all inconstant, transient, ephemeral. What is forever is the grandeur of elevated rock-face and vegetation and the profound expanse of truly unceasing waves. And yet change and flow are intrinsic to their cycles too, while our plaintive nature is a constant. At Arrábida, as in other things and places Portuguese, this impact is made very casually. Here is no belaboured “look at me, I am so spectacular” state park. Instead, the Portuguese government has declared this area a forest reserve, and left nature on its spectacular own. The mountains stand tall and arrogant and uncaring of what we think. The sea ignores the mountains, the forest and gawping tourists altogether and simply carries on its with its ebb and tide. My first glimpse of this paradise is from the ramparts of the cemetery at Seisimbra. I am no necrophile, and indeed the one thing I have not enjoyed on all my tourist expeditions in Portugal is the insistence on lingering over and discussing the remains of the dead. But at Seisimbra, the view from the cemetery impels me to walk past the gravesites. Over and over, what I am struck by is how little the ocean cares about our comings and goings, our admiration of it or our failure to notice. I grew up surrounded by sea, and yes, it was beautiful, but I think of the number of times I have sat with friends in front of an expanse of sea and been so engrossed in the ongoing drama in our lives that I have not so much as looked at it. It simply was there and like everything else about those years of my life, I could take it for granted. It was my home, my shelter. That is no longer true. The sea is my past and my future—as illusory and elusive as both most of the time. Until the odd magic moment, like the one I felt in Cabo de Roca. At Arrábida, I felt overawed by the sea, and I felt its distance from me. It lay there, distant, unattainable and with every fibre of my being, I longed for its embrace. At Arrábida, I was left only with ritual. I tried to speak to the ocean, but the distance and the feeling in my heart that I could not hold on to this vision, silenced me. Arrábida is the unattainable ocean of my dreams—ever-beckoning, never-heeding. These verbal caresses of the ocean would be incomplete if I failed to record the many colours inlaid—like mosaic or pietra dura—in the blue and gold visions I have raved about. Other colours lurk within this flat depiction of mine. In the place where the tour guide tells us to look, we can see the sea-bed, turquoise yields to a teal, malachite, ochre and gold. At Cabo de Roca, the sea is the precise colour of copper sulphate crystals, with gold dust. As we drive past the Estoril coast, the water looks sea-green, the pure aqua of the water blending with the brilliant yellow of the sunlight—rather as if the primary colours of a child’s drawing had run into each other. At one point on our mountain drive, a bright turquoise sheet is interrupted by designer patches of lilac-to-violet-to-iris. On a postcard, these would all look artificial and no camera could capture what the eyes have had the privilege of seeing. I arrived in Lisbon with a heed full of literary images. That may be responsible for the words that cried out to be written, every hour of every day, most of which I have lost before they could be recorded. But there is something in the air of this city that recalls the pleasure of moving pen over paper smoothly, watching words form sentences in your handwriting. It recalls the delight of watching your best handwriting deteriorate because your hand cannot keep up with your mind. It recalls the profound joy of being able to write. There is something about Lisbon that reawakens the aspiring writer in the tired political scientist. The guidebooks talk about Lisbon’s literary and revolutionary heritage. I walk by the cafés and imagine the debates and conversations that once took place where there are now tourists. On the tables, with the small cups of potent Portuguese coffee, sat newspapers, secret telegrams, Rousseau and Marx. Now I see Lonely Planet and Fodor and other guides to Portugal in a variety of languages. The smoke is still there, in this continent of smokers. Through the haze, I see the writer’s table covered with coffee-stained papers, dried up coffee cups and crumbs of cake and bread fossifying on the pages held down by a saucer. I hear the strident voices of those who would change the world. I hear the buzz of political gossip and the hush that falls over the room when someone speaks long and eloquently about something. I see the swift movements of men closing secret political deals. I must confess I don’t see to many women, and this is one reason I hesitate to go in. But I wander around and everything about this place reminds me of this long-standing wish of mine to take the sort of vacation that the heroines of English novels took, particularly after debilitating bouts of influenza. I would love to be somewhere exotic like Portugal or somewhere near the sea, to write and paint and think deep thoughts. I am so tired when I reach Portugal that there is no question I feel entitled to one of these long sojourns. I stayed on Rua Garrett during the second half of my short trip. This picturesque street, according to my guidebooks, used to be something of a literary and intellectual center, and I feel that I too must write while I am here. But the words don’t come to match that impulse. I find myself picking up the threads again and writing furiously at Lisbon airport, on the plane, in Newark and far, far away in my apartment. Lisbon’s literary air lingers, and I cannot tear myself away from writing even when I am not writing. My soul, fatigued by struggles of faith, acceptance and patience clings to the little creative spark that says my mind, weary with devising survival schemes, my heart leaden with disappointment and my spirit spent and tired after months of cheerleading the rest of me—are in fact, alive! One travels abroad to cease the perpetual motion within. Yet, voyages return one to the very center of one’s soul. And one’s most extensive explorations remain ultimately preoccupied with the recesses of one’s self. So going to Portugal ultimately allowed me to shift perspective in my navel-gazing. The internal-external dialectic is different because the external is different. In this account, there may be repetitions and inconsistencies. There are certainly bound to be errors of fact and judgment. And omissions abound—the beautiful churches and monasteries I visited, most notably. My excuse is that I am an apprentice at word-craft and in the word-mosaics I practise creating, some pieces are bound to fall off and some to jar with the design. My design itself is likely to be flawed and my execution to result in the overuse of some tiles and under-use of others. But the resulting mosaic reflects, I hope, my effort and my passion.